I always enjoy reading John Rousmaniere, and his tribute to Thomas Fleming Day [“Tom Day and the First Thrash to the Onion Patch”; July 2015; windcheckmagazine.com] was certainly no exception. While Tom Day was a member of many local yacht clubs, he was one of the founding members of Huguenot Yacht Club in 1894 and represented Huguenot Yacht Club in the early days of the Yacht Racing Union of Long Island Sound. As John emphasized in his article, Day was intent upon demonstrating the feasibility of safely crossing oceans in small vessels. Five years after the first Bermuda Race in 1911, Tom Day (along with Frederick Thurber and Theodore Goodwin), sailed the 25-foot Seabird from Providence, Rhode Island to Rome, Italy. 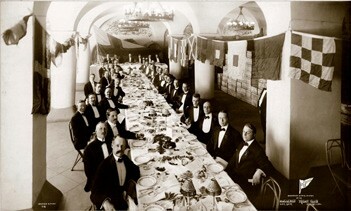 This photo of Tom Day being honored at the annual HYC dinner and election, at the Astor Hotel in New York City in 1912, is displayed in our clubhouse living room. Behind the dais is the enormous Huguenot Yacht Club burgee that Captain Day brought with him on his voyage across the Atlantic.